Ideal for long rides in less than ideal conditions. The AmFIB Bib Cycling Tight uses highly wind/water resistant ELITE Softshell fabric on the front leg and center back panels for superior wind and water protection. ELITE Thermal Fleece fabric panels everywhere else ensure effective moisture transfer while keeping in the warmth warmth. 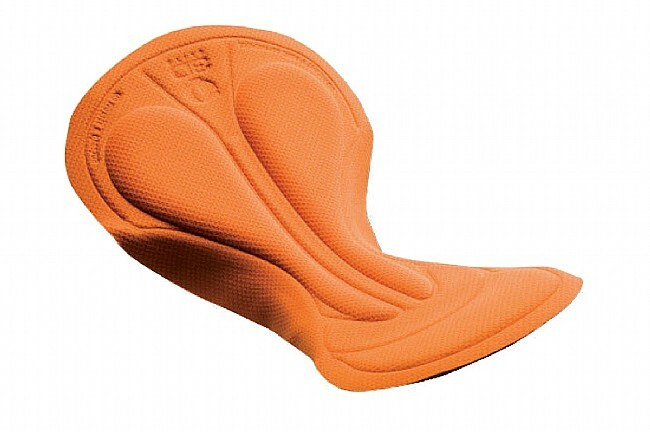 Unlike the non-cycle version, this tight features the ELITE 3D Chamois® pad for all day comfort. The Men's Elite AmFIB Tight features foot stirrups for a secure, water-tight fit. Reflective elements provide low-light visibility. This Cycling version includes the ELITE 3D Chamois® for all day comfort. This is my go to gear for the varying winter conditions in the Seattle area. Great for 45F and below, preferred over rain pants on most occasions. I wasn't sure if I would like the stirrups over zipper, but they seem to work better with my winter boots, and are definitely more comfortable. The chamois is a little thicker than I usually like, but is actually very comfortable. The panels on the hamstrings bring just enough cooling to prevent sweating, although they can be briefly chilly when starting out a ride below 30F. Size is accurate - I'm 6'3 - 230lbs and the XL fits well, with just a little extra in the legs. This is my second pair and my first pair is still going strong after 5 years, washed regularly on gentle and hung dry. I'm a loyal Castelli customer, but I gotta give PI credit here. They nailed it. These bib tights are heavy and a bit bulky, but what serious winter isn't? On the bike they feel surprisingly great and the bottom line is they are WARM. I get cold easil but I've worn them when temps are in the 20s and never got chilled. Nice touches include the stirrups (should be standard issue on all tights, imo) and the little access flap for answering nature's call without having to disrobe. I'm 5'11 160lbs and the M fits well. The legs are a bit long, but it sounds like that's true across all sizes. The one piece of clothing you must have when it gets really cold outside. I wear the AmFIB on the coldest days of the year, and they have always kept me warm. I looked hard for a pair of tights that will keep me riding all year long, I live in Savannah, GA, so it wasn't too difficult. This pair I hands down liked the best. The lower legs are nice and long, and I love the stirrups! They also come up nice and high to cover the love handles and help help you warm. I've ridden in temperatures down to 34 degrees and it wasn't my legs that were cold. I picked up these PI Elite tights with the hope that I can extend my riding a little further into winter conditions than I did last year. They didn't disappoint. In fact, they're amazing. I've worn them in temps up to 60 at ride end, and as low as the high 20's for ride start in the morning. They breathe, so my legs don't get sweaty on climbs and when it starts to warm up, yet they keep enough heat in to keep my legs comfortable into the mid 30's. This combination of breathability and warmth seems to defy logic..., PI really has something special here. I'm 5'10, 155, 31 waist, 32 inseam, and the M fits nicely. They seemed a little bit bulky when I first unpacked them, as any cold-weather gear does when I'm used to wearing Summer kit, but on rides there's no sense of restriction or bulk. I think they're about as light as possible with this level of protection. They're form-fitting and all-day comfortable, and the chamois is good for 4 hour rides. Fit is near-perfect, with just the inseam length a bit long for me, inseam is about 34. It's not an issue on the bike. When temps dip to the low 30's and below, I'm finding it difficult to keep my fingers & toes from going numb even when my core & legs are comfortable, so below freezing I'll be training indoors. Above that, I'm loving my PI tights, and I'll be out with them every chance I get this winter. These tights are very warm in weather down into the 20's and are very warm in the wind. Great chamois for riding and the flap in front comes in handy so that you don't have to take your layers off when you have to go to the bathroom. I highly recommend these. Worth the money if cold daays have been stopping you from going for a ride! I am 62 years old good condition for my age, six-foot-one 190lbs. Waist 36 inseam 32. I live in the foothills area of southern California, where mornings especially can be pretty cool (40-45 degrees) and stay cool if you are going to do some climbing in the local mountains. I thought these might be overkill but they have worked out great. My experience with Pearl Izumi has generally been very good and these bibs are no exception. The workmanship is excellent.I bought large, other than the legs being maybe an inch long for me the fit is great. The design is super comfortable I purchased the Pearl Izumi Men's Elite AmFIB Cycling Bib Tight for those days where the cold might stop me from going out, now I just slip these babies on with a nice light weight wool jersey and I am ready to go. I recently purchased these tights for winter riding and they fit the bill. Extremely well constructed and a nice fit. They are much warmer than I expected so will be used when the temps are below 40. I like the extra protection provided on the front of the bids for wind and water. As with most of the Pearl products, these are a high quality piece of equipment designed to last for years of service. SizeI am usually fit medium, sometimes small (152 pounds, 5' 10), and these in medium are definitely snug, and just a tad long. So large would be too long, small too tight. But on the bike the fit is good, and not restricting. Tried them out on a crisp 40 degree day with a N wind at 5-10, on a hilly ride with a 6 mi downhill at 25-40 mph, and kept warm without getting overheated on the 6 mi uphill. They provide the wind resistance that my Pro Corsa warm bibs lack, and extend the range of cycling weather one more notch down! Great fit, very well made and really appreciate the front opening. Use on days when temperature drops below 50 degrees for 20-30 mile rides in New England. I live in Hoboken in NJ. It gets pretty cold in winter. The lowest temp i rode in this bib is 30F. In that weather, it is not my legs or knees that bother me, but my toes and my lungs. Now i use a face mask, wool socks and toe covers. It is a bit snug though. I am 5-11 and 185lbs. I ordered Large.